Support a full-range of school sports that is the physical education complement of Conneaut Area City Schools’ excellent academic program. Support a new community recreation program serving pre-school to senior citizens that is available to the community. Host a variety of events: sports, performing arts, festivals, and community gatherings. Offer first-ever spectator amenities (good seating, restrooms and concessions) to attract audiences from within and outside Conneaut. Be accessible to the greater Conneaut community. And there was one more very important stipulation: fund SPARC using grants and private donations since local public funding was fully committed to supporting Conneaut Schools’ strong academic programs. It was a tall order. After 18 months of research and planning in partnership with the Conneaut Area City Schools, CARE released its plan. 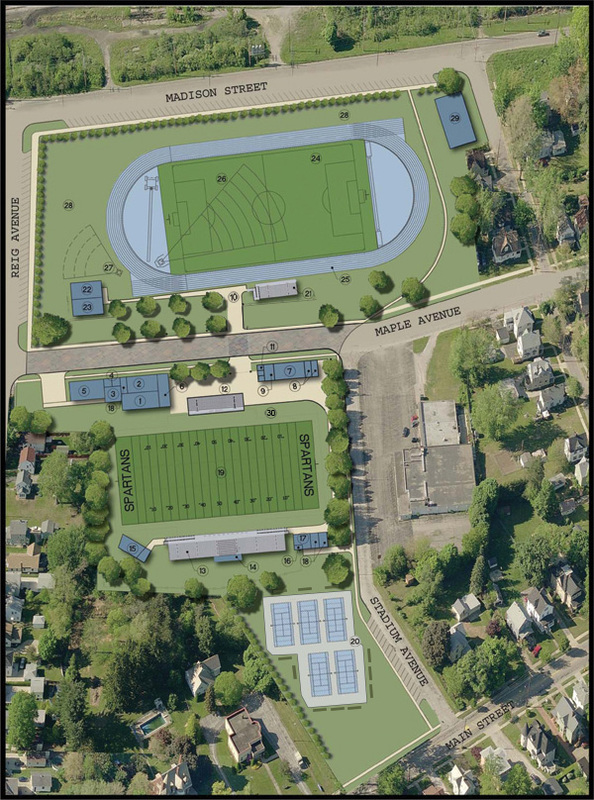 SPARC will be a 20-acre school athletic, recreation and community event campus in central Conneaut adjacent to Conneaut High School. It will be constructed over the next five years, supported by a broad-based capital/endowment campaign seeking $5.5 million in donations and gifts-in-kind from private sources.